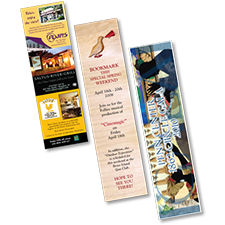 For quality full-color bookmarks, Bargain Printing offers complete solutions. Whether you are looking for single or double sided bookmarks, full color for more impact, Bargain Printing has you covered. Do you want to add a great collectible to accompany your invoicing? Drop in a bookmark with a simple message. You can remind your customers to call you or point them toward your website. Do you have a great new product you want to advertise? Try the simple, direct format of a bookmark. Your customers will see you in a new light. Need followers on Twitter? Use your Twitter name with your logo. Can anyone have too many friends on Facebook? Not possible! Print a reminder that you are also on Facebook and have that bookmark help you connect with everyone you know. Bookmarks give you the chance to make your point. 1.5" x 7" 2" x 8"